Irish-born, London-based soprano Jennifer Davis is a Jette Parker Young Artist at the Royal Opera House, and she’s currently in the middle of a run of Mitridate, re di Ponto at Covent Garden (onstage until July 7). Roles like Donna Anna (Don Giovanni), the Governess (The Turn of the Screw), and Adina (L’elisir d’amore) keep Davis busy onstage, and she first caught our attention as Ifigenia in Handel’s Oreste at Wilton’s Music Hall. Davis comes by music honestly; she chats about being surrounded by music and singing in her youth, and the undeniable love she has developed for opera and the stage. I’ve always loved to sing. Growing up there was so much music in my house of all different kinds. My Mam was, and still is, a singing teacher so there was always somebody singing in the house, and not just classical music. My brother is a drummer and into lots of jazz and funk, my older sister loved rock and pop; me and my younger sister would listen to all the hits and my Dad loves the classics like Frank Sinatra, The Eagles, Billy Joel and Country music…you name a genre and it was more than likely there. I sang along with it all and listened to my Mam singing and teaching others how to, and so it’s always been in my life. I joined a church choir, sang in choirs run by my Mam, was on stage in musicals from a young age, and so to some degree you would think it was a no-brainer that I’ve ended up singing professionally, but I actually studied English literature at University. I think I saw singing as “Mam’s thing”, and so I didn’t start properly training my voice classically until I was 24, which is quite late! After my degree I started singing again and fell back in love with it, applied for a Masters in Voice at DIT’s Conservatory of Music, and shockingly they accepted me. I honestly thought I’d get some advice and nothing more, but that was the start of it all and I’ve worked hard and have had some wonderful support and lucky breaks since then. I look back now and think I was always meant to sing, but it took me a while to see it for myself and take the plunge, and I now can’t imagine doing anything else. 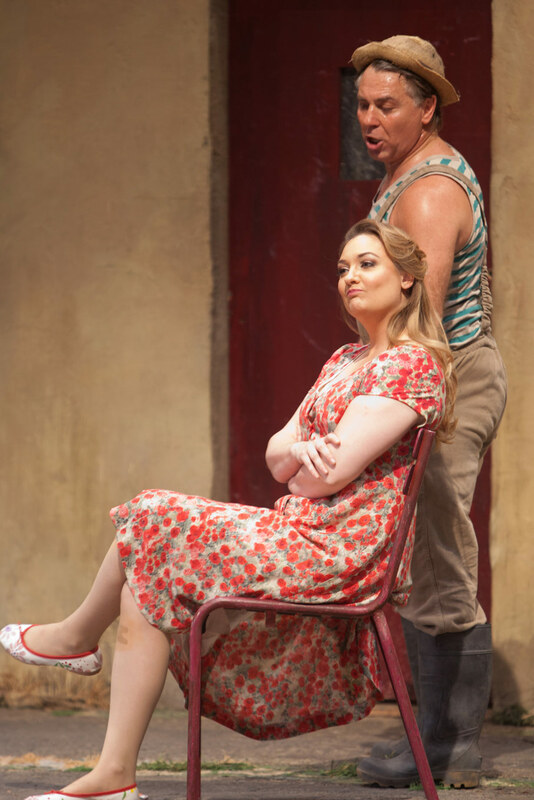 Jennifer Davis as Adina and Robert Alagna as Nemorino in L’elisir d’amore, Royal Opera House, 2017. Photo: Neil Gillespie. For me, good singing is someone with a solid vocal technique, but I’m not aware of it as a spectator. What I personally find thrilling to see and hear is someone connecting with the music and the drama, almost unaware of the technical work involved, and getting to that stage takes a hell of a lot of practise. It’s being so in control of your instrument that you can ask it what to do when you’re feeling something in the moment and it will respond. Honestly, this is still a huge work in progress for me, as well as for most singers I would imagine. It’s what we’re striving towards every day. I may never get there 100%, and experiencing vocal freedom like that is not an every day occurrence, but when I have a good day and my voice is doing exactly what I want it’s the greatest feeling in the world. It’s as though my soul is singing rather than my tiny vocal chords coming together…it’s utterly magical! I can’t speak for everybody, but I know the advice I would give myself when I was starting down this road, and that is to have fun when you’re practising, and accept that the first few times you sing through a piece that you may sound like you’ve smoked a cigar and never had a singing lesson in your life, and that ultimately, this is okay. Patience and diligence are the two words that come to mind. Voices need time to develop and get stronger and this happens at different rates for everyone. I think that’s why the human voice is so fascinating and our ears prick up when we hear someone singing, whether it’s on an operatic stage or someone busking at a train station. Voices are unique and they need individual care and nourishment. I think less worry, more play would be my answer here. Also to experience your life and not lock yourself in the practise room too much…we’re singing actors, and we should be cultivating our dramatic abilities alongside our vocal ones. Read, watch, sing, challenge, discuss life and all its quirks, because that’s what our job is, portraying human beings at their highest and lowest points. A few others would be Arabella, Marguerite, Juliette, Manon, Mimì, literally anything by Mozart - sign me up. I like playing women who have something to say, and I’d love to be involved in more new works. It’s exciting to think about the road ahead. What have you learned about your career as a singer, solely through professional experience? Honestly, I think that most of my learning has taken place in a rehearsal room. It’s there that you get to explore yourself and you also gain so much from your colleagues; their input cannot be emphasised enough. The conversations you have in those spaces are where a lot of my own self-discovery and development have taken place. Of course performances are a huge learning curve because that’s where you have to truly step up and conquer the nerves and self doubt, put yourself aside and be the part of the big wheel you are meant to play. Nothing prepares you for that besides actually doing it. My time at the Royal Opera House over the last two seasons has taught me a lot about myself and the career I want to foster. I’ve learnt how I learn, what the tools are that I personally need to be prepared, what I can handle and what my recovery time needs to be. I’ve watched how more experienced artists deal with their workload and take care of themselves. Vice versa, I think I’m also acutely aware of the work I want to be doing. I don’t just want to work to eat…I want to play roles and be part of pieces that improve me as an artist and as a human being and that feed my soul. More than anything, working at this level has reassured me that I’m on the right path, even though there are days where I doubt my ability and my strength because I’m tired and stressed and feel like I can’t sing a single note…the good days far outweigh the bad. Do you know an artist who deserves a little Spotlight? Let us know! Get in touch at [email protected].